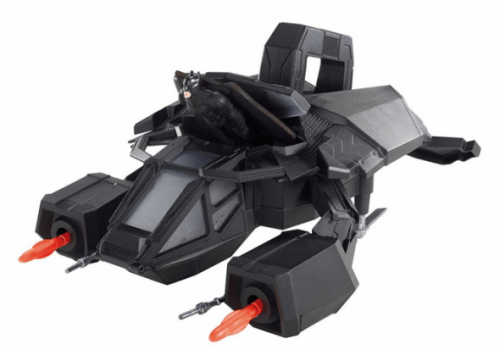 The Batman The Dark Knight Rises The Bat Vehicle is on sale for $9.09 at Amazon right now. That's 72% off the list price of $31.99! The Batman The Dark Knight Rises Movie Masters Collector Bane Figure is on sale for $6.98 at Amazon right now. That's 59% off the list price of $16.99! The Batman The Dark Knight Rises Movie Masters Collector Catwoman Figure is on sale for $9.97 at Amazon right now. That's 41% off the list price of $16.99! The Batman Dark Knight Movie Master Exclusive Deluxe Action Figure Survival Suit Bruce Wayne is on sale for $5.98 at Amazon right now. That's 65% off the list price of $16.99! The Batman Dark Knight Movie Master Exclusive Deluxe Action Figure Harvey Dent with Coin is on sale for $6.98 at Amazon right now. That's 61% off the list price of $17.99! The Batman The Dark Knight Rises Batpod Vehicle is on sale for $21.99 at Amazon right now. That's 37% off the list price of $34.99! The Batman “The Dark Night Rises” Lenticular (3D) Puzzle, 100 Piece is on sale for $10.89 at Amazon right now. That's 39% off the list price of $17.99! The Batman: The Dark Knight Rises: Batman Child's Costume Set with Mask, Cape and Batarangs (Black) is on sale for $7.50 at Amazon right now. That's 50% off the list price of $14.99!